In her June 2012 report titled “Moving Forward,” Senior Director for the Office of Online Education Barbara Bichelmeyer outlined IU’s strategy under the three-year IU Online initiative. Now in its third year under the initiative, the Office of Online Education is transitioning from a cash funding model to the base funding model required to sustain the operations of the organization. As a result of this transition, Bichelmeyer recently prepared a new report, Moving Forward 2.0, which discusses planned activities and a sustainable funding model for the office as it moves into the future, serving both as a curricular clearinghouse and a provider of seamless student services. Who are our online faculty? Our February 2015 newsletter prompted Elsa Kramer of the School of Informatics and Computing at IUPUI to ask if we had data on the number of full- and part-time faculty teaching online classes. For our analysis, we counted any class that could be taken by students from a distance, including online, live video, and combination online/live video classes. In spring 2015, 1,044 faculty (13% of all university faculty) taught one or more online classes, while 417 faculty, or 5%, had teaching schedules that were fully online. The table below shows the characteristics of these spring 2015 online faculty, including tenure status and percentage with doctoral degrees. Characteristics of all university faculty and regional campus faculty are shown for comparison purposes. Thanks to Elsa for this thoughtful question! If you have questions about this or any other online data, contact OOE Data Manager Sharon Wavle. A new search tool on the IU Online website allows students to see all of IU’s online classes without having to search campus by campus. The tool, created by Office of Online Education staff members, has been a tremendous success with students, with 3,745 hits during the months of April and May alone. Get a glimpse of the number and variety of online classes that IU currently offers by trying the tool for yourself. Go to http://iuonline.iu.edu/classes/search.php, pick the fall 2015 semester, and search “all” classes. Or, play around with different campuses, semesters, and keywords. It’s fun! For a more detailed look at upcoming online classes, click on the Enhanced Class Search to the right. IU Online Class Connect provides an increasing number of regional campus students the opportunity to take online classes from a campus other than their “home” campus of enrollment without going through the intercampus transfer process. Improvements to the IUOCC process in spring 2015 included the ability to offer unique classes to other campuses, as well as the offering of classes required in support of the Bachelor of Applied Science joint academic program. Campus chancellors, executive vice-chancellors for academic affairs, and registrars meet regularly to review online class offerings and decide which to offer through IUOCC. The Office of Online Education continues to work with USSS and UITS to increase the number of courses eligible for inclusion in IUOCC. More information about IUOCC, how it works, and what classes are included, is available on our IUOCC FAQ page. 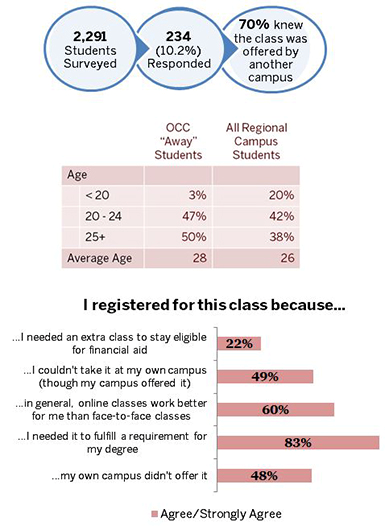 To better understand the impact of IUOCC on students, we surveyed those students who took an IUOCC class at a campus other than their “home” campus of enrollment in fall 2014 or spring 2015. These students, enrolled in an IUOCC “away” class, took an average of 11.2 credits hours per term, compared to 9.7 credit hours for all regional campus students. The students who took an IUOCC "away" class tended to be older. We asked them why they registered for the "away" class and found that most were using it to make progress toward their degree. When IU reached its first-year anniversary as a Quality Matters (QM) subscriber, eLearning Design and Services (a unit of University Information Technology Services) conducted a focus group with teaching and learning directors and interviewed QM facilitators across the state to evaluate the usefulness of QM at IU. These sessions confirmed the value of the QM standards for quality course design, but also pointed to a desire for more flexible QM training to better align with IU campus missions and cultures. As a result, the Office of Online Education, eLearning Design and Services, and Quality Matters are researching alternative models for QM training at Indiana University. The Office of Online Education and eLearning Design and Services hosted the QM managing director and director of faculty development in Bloomington this spring to continue the discussion and consider next steps. The Office of Online Education provides the subscription to Quality Matters for all seven IU-managed campuses. Quality Matters is a national, research-based standard for quality in online course design. The campus centers for teaching and learning have trained nearly 300 IU faculty to use the QM standards in designing their online courses so far. In addition, the Office of Online Education is working to develop and fund internal QM-inspired course reviews, as well as official course reviews, for faculty who request them. Learn more about Quality Matters. As a steward of the tradition of excellence at Indiana University and in partnership with the campuses, the Office of Online Education provides leadership, coordination, and resources to the IU community to serve students and promote learning through quality online education.